When many people think of Under Armour, that motto is the first thing that pops into their head. But when Sonya Curry, the mother of Stephen Curry, the Golden State Warriors do-everything guard, first met with executives from Under Armour, she didn’t care about protecting a house. She wanted to know if the brand could protect her son. “Absolutely,” Rattet said without hesitation. Rattet knew that Stephen and his family were trying to suss out Under Armour. The company was at an inflection point. Even though the Baltimore-based brand had been making footwear for nearly a decade it was still thought of in some circles as only an apparel company. Partnering with Curry was a chance to cement its legitimacy in basketball. Curry saw the bigger picture as well. “A lot of people questioned my decision because Under Armour Basketball was up-and-coming, but I saw the potential,” Curry says. Under Armour had amassed an army of talent located around the globe—designers, engineers, quality-control teams—capable of making world-class sneakers that performed on the highest levels. When that army focused on creating a signature sneaker for a player as versatile as Curry, it brought out the big guns, utilizing advanced technology, materials, and designs. The result is the Under Armour Curry One, and any remaining doubters need look no further than the ridiculous move Curry dropped in his new kicks against the Los Angeles Clippers in early March, dribbling between his legs and behind his back through a sea of defenders before draining an impossible three. That meeting in Charlotte was more of a get-to-know-you affair. 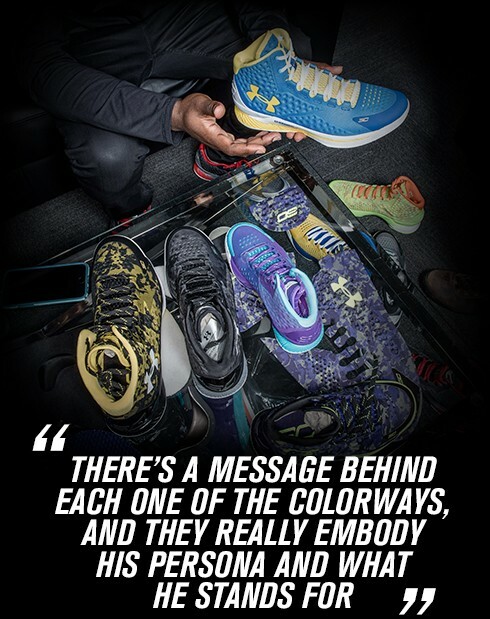 It wasn’t until Dave Dombrow, Under Armour’s vice president of design, and Ron Johnson, a senior product line manager for basketball footwear, visited Curry’s home outside of Oakland that the Curry One truly began to take shape. A meeting that was supposed to last just a couple of hours stretched to six. The Under Armour team ended up staying for dinner, a memorable feast of gourmet appetizers and flatbread pizzas prepared by Curry’s wife, Ayesha Curry. “When I say she’s a chef, she’s a chef,” Dombrow says. Aside from filling his stomach, Dombrow also filled his head with ideas as he tried to soak in as much information as he could about Curry, from his style to his cars to his hobbies. (Word to the wise, don’t play golf against Curry unless you’re looking to take an L.) Dombrow talked to family members and friends to get their insights. All of this helped him get a better sense of Stephen Curry the man that he could then incorporate into the sneaker. The Under Armour team had already learned a lot from Curry’s experience in previous models like the Anatomix Spawn and the Clutchfit Drive. For Curry, the top priority above all others—above looks, above everything—was performance. And not just for him. Curry made it clear that not only did he want a shoe that worked for him, but one that young ballplayers could have a great experience in as well. Not that Curry didn’t have opinions about design. At that first meeting at his house, Curry was wearing a pair of SpeedForm RC running shoes, which have a distinct unibody look. He preferred a simple and clean design which hadn’t really been seen in a basketball shoe. Over the course of subsequent meetings, the Under Armour team presented Curry with prototypes and renderings. At one point, there were two variations of the shoe and Curry led the push for his favorite. Doing something that has never been done before is never easy. It’s especially challenging when you’re trying to build a sneaker that addresses the needs of a basketball player that does so many things. A perfect storm led to finding the right cushioning. 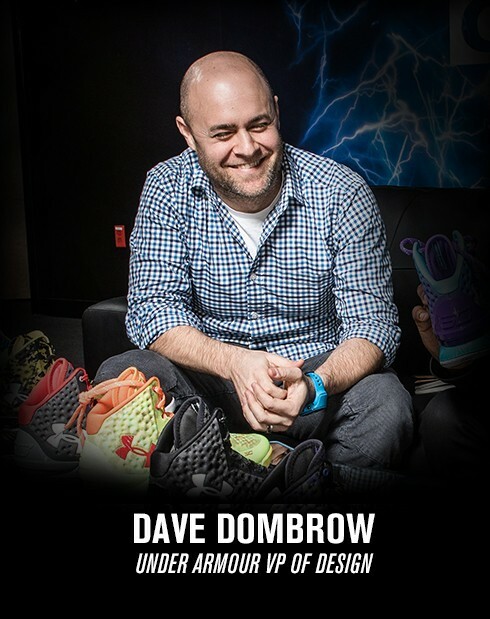 Prior to partnering with Curry, Under Armour had been developing a new compound in partnership with Dow Chemical to be incorporated into other shoes, not just basketball kicks, but it happened to be exactly what Curry was looking for. The Charged Cushioning that debuted with the Curry One is adaptive. When you’re standing it provides a soft feel underfoot. But when your feet push down into the Charged Cushioning, it firms up to provide a more stable platform. As challenging as it was to develop a new cushioning system, it paled in comparison to what it took to develop a material for the upper that could support Curry and flow with him at the same time. The Anafoam material used on the Curry One is the mashup of a mesh that had been used in Under Armour apparel with a foam used in their footwear. The two are co-molded together to form a textile that offers exceptional support without limiting mobility in any way, as anyone who has watched Curry play this season can attest. Getting the Anafoam exactly right required hundreds of different trials, with minute adjustments to thickness, foam compounds, and even textile structures. Early versions were too stiff, but eventually the team dialed it in to Curry’s delight. “The first time he saw one of the early prototypes, he was really excited by it,” Dombrow recalls. All of the innovations add up to a shoe that is greater than the sum of its parts. It might just be the best-fitting basketball sneaker ever. Under Armour designers didn’t just pay attention to the outside of the shoe, they focused on what was inside as well. The heel panel wraps around the Achilles and fills in the gaps so that the tendon is protected. The heel counter is external to lock down the back of the foot, while still allowing the Anafoam to shroud the heel and provide additional support. While Curry’s game is reflected in the technology of the Curry One, his life story is told in the various colorways. The Curry One officially launched at NBA All-Star Weekend, and he used the game to debut a colorway called Dark Matter, named after a material in space that cannot be quantified, much like Curry’s game. The dark purple print has a camouflage-like appearance that also pops up in other versions of the shoe. The lace tip on one shoe says 1988, the year Curry was born, while the other lace says 1938, the year dark matter was discovered. One of the more attention-grabbing versions is Candy Reign, and it was born out of the Under Armour team discovering Curry’s sweet tooth. In case you ever visit, there is literally candy stashed throughout his house. Curry also got to give a shout out to his dad, Del Curry, who played 16 seasons in the NBA, including 10 with the Charlotte Hornets. The father-to-son colorway features the Hornets purple and teal and has “30/30” on the front of the tongue to represent Stephen and Dell’s shared jersey number, and each player’s three-point average is printed on the inside. Those storytelling elements are woven throughout each colorway, from the Underdog version that references all the knocks on Curry coming out of Davidson College, to the MI:30, which is a nod to the secret agent persona that Curry takes on come playoff time. But there is still one colorway that’s missing—for now. And the innovations that the Curry One pioneered are starting to make their way into other Under Armour products. The Charged Cushioning has potential applications in running shoes, and the adaptable fit that Anafoam provides could also work in football and baseball footwear. But last summer, at the Stephen Curry Select Camp in San Francisco, no one was thinking that far down the road. Johnson delivered some finished product and was walking through some of the different colorways, and Curry couldn’t contain his excitement. He was running around showing the different shoes to his friends and family. In the middle of Johnson’s run-through, Sonya Curry stopped him. “Thank you,” she said in a manner that was clearly heartfelt. She had asked the team at Under Armour to keep her son safe, and they had done that. They’d also done so much more.